Restoration of stone is the restoring of worn stone to the state in which it was installed. It may also entail the altering of the stones surface to match a desired finish of the installation�s owner or management. In some cases an owner may desire a polished surface to be honed or visa versa. 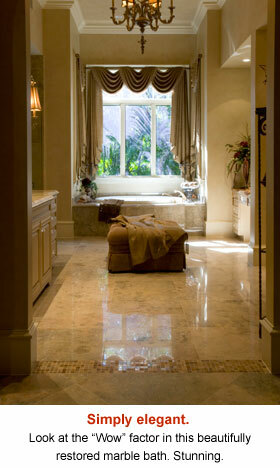 Restoration is a process that can only be done by a professional stone restoration company. Your typical maintenance/janitorial or carpet/tile & grout cleaning company will not have the proper tools or experience to restore natural stone. True stone restoration does not include just cleaning and sealing of your stone, this will do nothing to change the look of your stone's appearance except to make it look cleaner. This is not said to be critical to these types of companies. The investment of knowledge, equipment and experience needed to understand and work with stone properly is greater than what your average cleaning company can afford to pay for qualified technicians to stay with the company. Restoration of marble, granite, limestone, travertine or other natural stone involves the removal of scratches and/or other damage from the surface of the stone by means of mechanical abrasion. This is known as diamond grinding, and gives you better clarity and reflectivity than other methods that can used, such as the use of sanding screens or crystalization. A stone floor that has been restored with diamonds will also retain it's look longer than it will with the use of these other methods. While the use of diamonds may cost you more in the beginning, having have your floors done every 4-6 years compared to every 1-2 years (as with other methods) costs you less in the long run. A flamed finish can be restored using the same technique used in the processing of the tile or slab. This is a controlled burning of the stone so that the crystals �pop� creating the unique finish. A restoration professional will also take care to protect the surrounding surfaces from damage. The diamond grinding technique involves large amounts of water and this could be damaging to wood and carpet if measures were not properly taken to ensure the water�s use was kept to a minimum and protection against splatter used. The flaming technique obviously entails using a large open flame tool. One would want to ensure that flammable materials were not around and that ventilation was adequate. Stone restoration jobs are usually charge by the job. Square footage pricing is not practical. Each type of stone will present its own unique challenges as will the consumer�s desired result for each surface. Many aspects need to be taken into consideration, such as where in the building the stone to be restored is located, water and electricity supplies available, etc. Regardless of the cost, it is always less than the price of replacement and most times you will have an installation that looks as good as, if not better than new.